This is my next winter project. I thought I've done them all (A/C, BOSE, SRS, ECU, TCS) so this is my next and hopefully last one. Thanks for tip on checking the speedo accuracy. I will do that next time when I get on the freeway. My brakelight on the cluster was lighting up occasionally before so I will see if it happen as you mention that is a serious fire problem which shall be a big caution for everyone. Thanks for sharing! Is this a service you will be offering Kaz? Glad you managed to fix the issue. If you replaced the caps with different spec, you may want to double check the speedo against the GPS as you may have introduced some error between the two. Car manufactures tend to on purposely set the speedo reading bit higher than the actual figure but it could go the other way round after replacing the caps. You should be able to adjust it by turning the small VR at the top of the gauge. You can access them behind the sticky tape. The capacitor leakage and damages to the circuit board on the gauge assy are becoming common failure these days as our NSX is getting really old. Currently, Mr Toyoizumi at T3Tec are dealing with 6 dash gauges in a row. The common failure mode is the speedo showing much lower figure compared to the actual GPS reading and the famous ‘BRAKE LAMP’ warning indicator stays On forever even when there is no bulb failures at the brake lights. 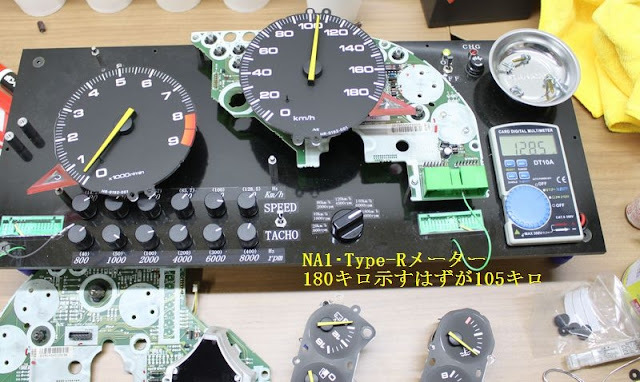 This NA1 Type-R speedo should be at 180kph at this signal frequency but only showing just over 100kph. Another gauge showing the correct speed at the same frequency but the ‘BRAKE LAMP’ warning stays On even when the detection circuit is connected to the GND. The ‘BRAKE LAMP’ warning can be triggered by several reasons but if you checked all of the light bulbs and the big 20pin connector at the left forward section of the boot behind the carpet and still getting the same issue but intermittently, then you may want to consider servicing the dash gauge assy. I originally saw the burnt dash gauge example on NSX Prime but it also happened on several NSX in Japan. 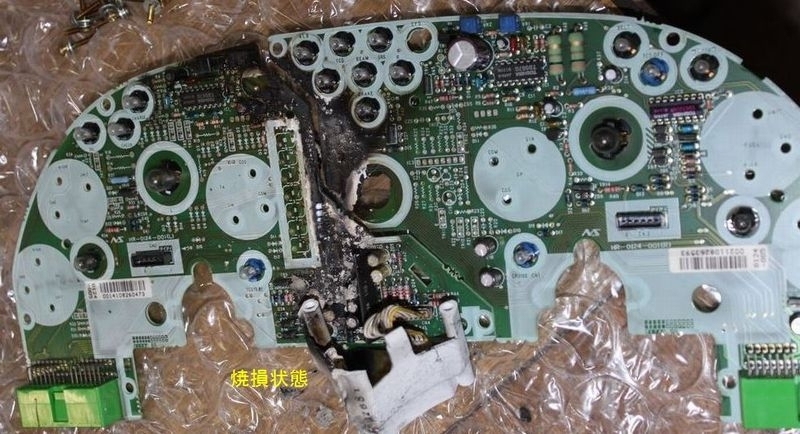 On one occasion, it ended up with serious discussion between the Honda customer support, R&D, gauge manufacture, fire department in Japan as it was considered to be production car fire incident on the public road. You don’t want to see smoke suddenly coming out from somewhere behind the steering wheel while you are driving…..
there are two VR1 and VR2 potentiometers- trimer on a single printed circuit board.